Starting as low as $30 for a custom made stand. BEFORE ORDERING please read the item listing for clarification about what is being sold and the ordering process. 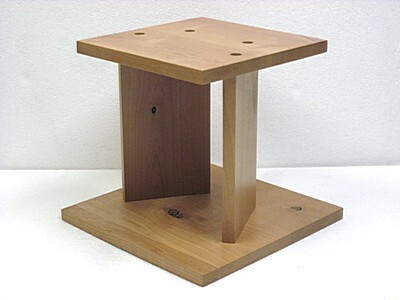 Order a custom stand today and get 12% off the total stand price. Use the savings toward customizations, such as larger stand size and upgraded finish. Birks Place is on the internet! 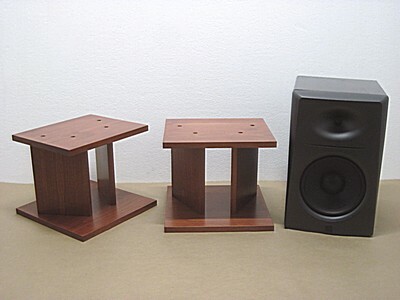 Custom made speaker stands for your music studio, home theater, audio/video installation, and anywhere a custom stand is desired. Made to your specifications, many possibilities. Get the perfect size and height, and a great looking stand! 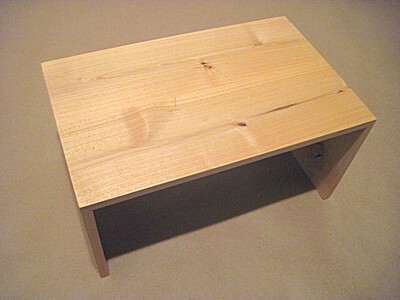 Made of Northwest Alder hard wood, a feature found in higher quality furniture. Get the look of real wood. 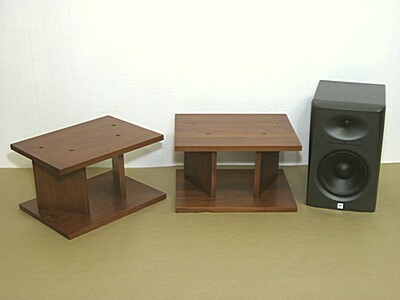 Different wood colors are available. Unfinished is also possible. This is an upgrade from cheaper stands made of particle board, plastic, thin metal, soft pine/cedar wood, and other materials. These stands provide a healthier alternative to MDF and other composite materials with offgassing and toxicity issues. Stands have a clean modern look. Stand design scales from mini desktop size to large floor size. 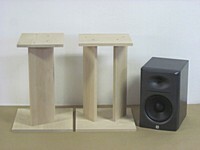 All wood construction resonates and reflects less than metal stands, providing a more accurate listening experience. The finish is a multiple step process using high quality professional coatings, not plastic laminate, house paint, or other low budget coating. The resulting look is nice, not cheap. 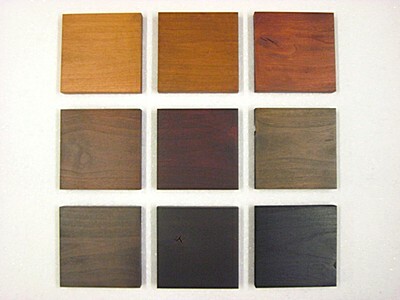 A range of finish options are offered to acccomodate budget, needs, and desires, from low-cost utilitarian to approaching the look of higher end furniture. 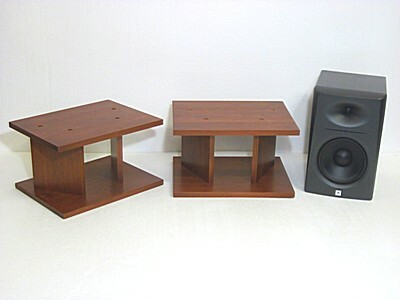 Small size stands can handle up to 20 lbs or more depending on stand size. 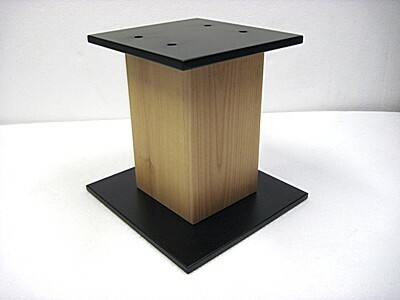 Medium size stands can handle weight up to 35 lbs or more depending on stand size. 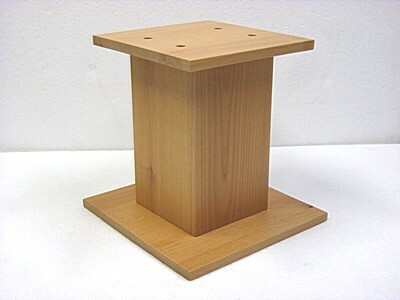 Large size stands can handle weight up to 50 lbs or more depending on stand size. Stands that handle larger weight can be special ordered. Price is for one basic stand. For details about the basic stand, see the Customizing section below. Made in USA. Some assembly required. 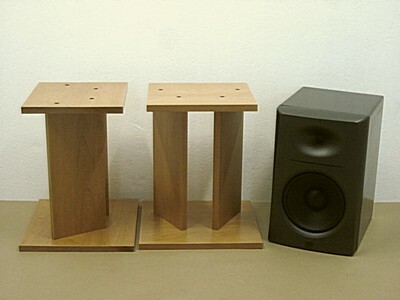 Below are example stands with various customizations that can be ordered. This is a custom made, made to order item, not pre-made or standard size. Listing price is for one basic stand. Orders that go beyond the basic stand limits will be an additional cost. See the Customizing section for more information. Before ordering please read the How To Order, Shipping, and Payment sections in the listing below. And much more, your imagination is the limit. Custom made is a limited production item, not a mass produced product. Cost is generally higher because of the lack of mass production and optimized distribution. Ordering custom made is like hiring a local contractor to do work for you, such as an artisan, craftsman, or tradesman. It can take several or more hours of skilled labor over several days to make a custom item to your specifications. Shipping carriers do not discount much for small volume shipping. Cost is not being subsidized by foreign governments like is occurring with many imported products. What makes custom made better? Price is not the only measure of value, otherwise everyone would simply buy the cheapest product available. With custom made you have the value of the custom size, custom features, healthier materials, and quality workmanship. Having the right size item for your needs without compromise is peace of mind. In a work environment, custom made can help increase your productivity. With custom made, you can get something that is unique and cannot be bought as a mass produced item. Birks Place is a brand of custom made furniture and woodworking, accommodating a range of budgets and needs, from low-cost utilitarian to approaching the look of higher end furniture. This listing is divided into sections. It is recommended that you first do an overview of the entire listing, then review the About Custom Made, How To Order, Shipping, and Payment sections, then review the Customizing, Help Guide, and How To Estimate Cost sections, then go back and review relevant sections when drafting an order. You can use the template below and insert the stand dimensions and other details into the '()' placeholders. There is a help guide in the listing below that can assist you in determining the stand size. The stand dimensions and other details you provide will indicate what customizations have been ordered. If weight handling is a concern, please include the weight amount that will be placed on the stand and order will be checked to see whether the default material thickness will be sufficient. Please double-check your order to make sure the stand size, finish quality, and other ordered customizations are what you intend to order. Follow up will be done to finalize the order and arrange for payment. Once payment has been completed your order will be added to the next production batch. 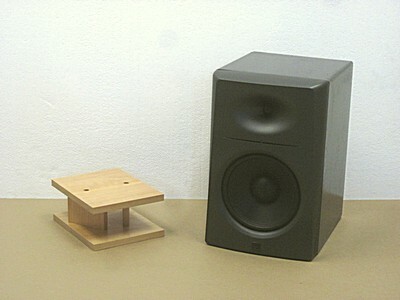 The front dimension is the side-to-side dimension (across the speaker front). 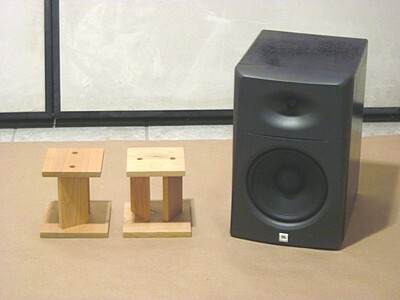 The side dimension is the front-to-back dimension (along the speaker side). 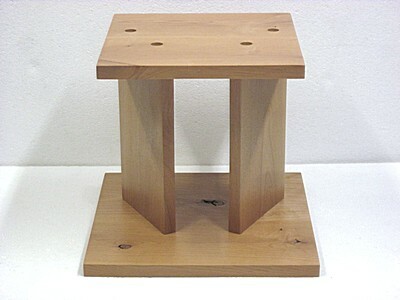 Please note, this stand model looks best when the top and bottom plates are square or nearly square. With plates long in the side dimension, skinny columns may result. 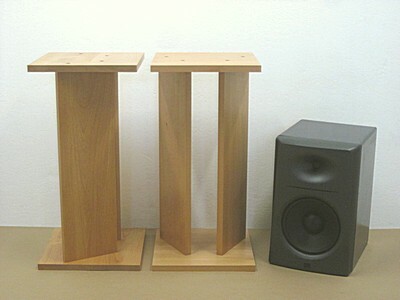 Plates long in the front dimension can work, such as a stand for a center speaker. 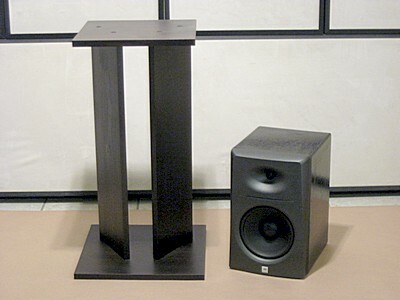 For speakers that are long in the side dimension, other stand models may be a better match. At the speaker location, raise or lower your speaker with books, magazines, or similar, until you achieve an optimal speaker height. You then measure the height to the bottom of the speaker. 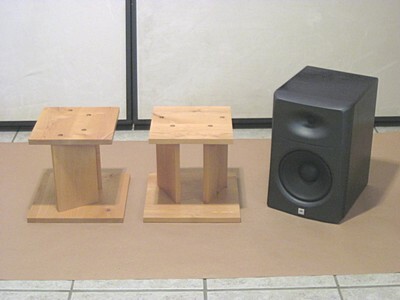 Measure the front and side of the bottom of your speaker without any front grill or panel attached. For the top plate, subtract 1 inch from the measured speaker bottom. For the bottom plate, add 1 inch to the measured speaker bottom. 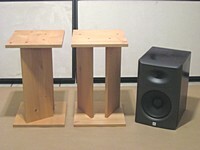 For example, if the speaker bottom measures 9 x 10 inches, the top plate will be 8 x 9 inches, and the bottom plate will be 10 x 11 inches. 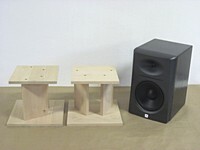 For larger speakers one may want to subtract 2 inches for the top plate, and add 2 inches for the bottom plate. 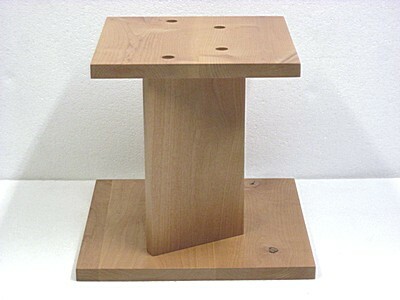 For tall stands, or stands that need more stability, one may want to add additional inches for the bottom plate. To help with the design process, one can make paper cutouts of the plates and columns to get a visual idea of what things will look like. Making estimated paper cutouts of the top and bottom plates and comparing with the speaker is a quick way to determine the plate size. This is only a guide. You can determine your own dimensions within the dimension limits. 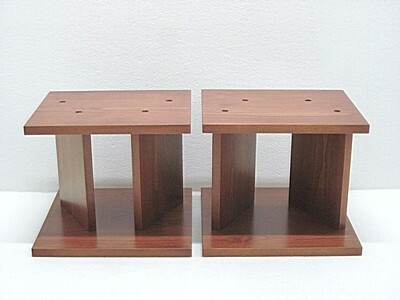 For desktop stands, to conserve desktop space, one might consider making the bottom plate the same size as the top plate. 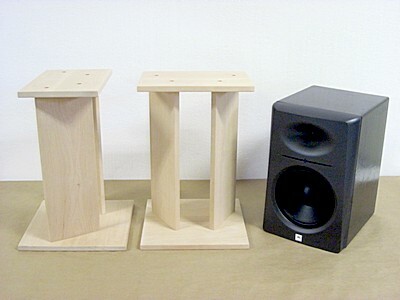 For a pedestal look, one might consider making the top plate larger than the speaker bottom. 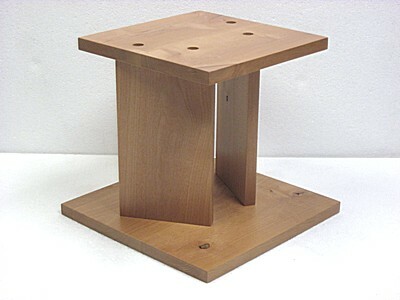 If the basic stand fits your needs, the cost is the price of this listing. If you need customizations that go beyond the basic stand, to estimate cost, you simply add the price of the basic stand and the price of the desired customizations. 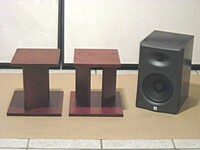 Example pricing, if you would like the basic stand to be customized to be 24 inches high with 12x12 inch top and bottom plates, with the enhanced finish, then the estimated cost will be the basic stand, plus the Up to 24 inch Height, plus the Up to 12 inches Plate Front, plus the Up to 12 inches Plate Side, plus the Enhanced Finish Quality customizations. This is a custom made, made to order item. Stands are sold individually. Each stand has two columns, a top plate, and a bottom plate. Customizing starts with a basic stand, then customizations can be ordered at an additional cost. Orders that go beyond the basic stand limits will be an additional cost. Prices for various customizations are provided in this listing for purposes of estimating cost. There is an Ordering Tips section in this listing that can assist you in determing the stand size. If you are unsure about what to order, please contact and describe what will be placed on the stand and the weight, and suggestions will be provided. There is a How to Estimate Price section in this listing that can assist you in estimating cost. If you would like help determining the total price, please submit request with a proposed order using the order template, and pricing will be provided. For this model a tilted top plate customization is not available. 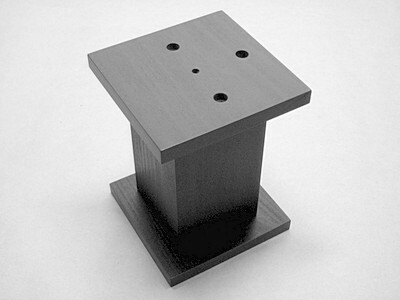 See the Big Column stand models for tilted top plate. Manufacturing tolerance is up tp 1/8 inch. Looking for a customization not listed here? Please inquire about possibility and pricing. 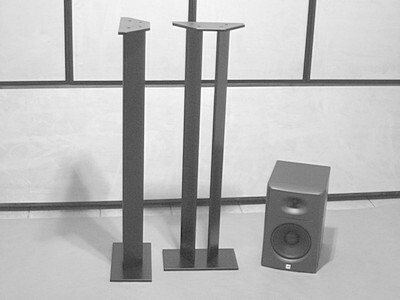 The following stand heights can be custom ordered. Pricing is provided for estimating cost. Larger stand heights available by special order. Stand height is the total stand height, measured from the bottom of the bottom plate, to the top of the top plate. Because of the unbraced column design, weight handling will go down as the stand height increases. Stands can handle maximum weight up to 24 inches high, and then weight handling gradually goes down as the stand gets taller. If one needs maximum weight handling with taller stands, see the Big Column stand models. The following plate front sizes can be custom ordered. Pricing is provided for estimating cost. Larger plate front sizes are available by special order. 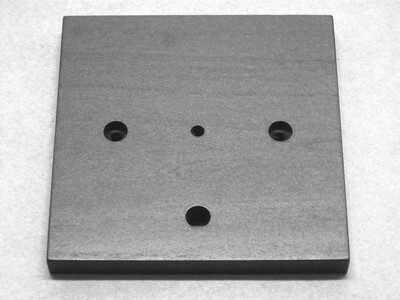 For this stand model the plate sizes are limited to square or nearly square, or when the plates are long in the front dimension. Plates long in the side dimension will result in skinny columns and cannot be ordered. The plate front dimension cannot be smaller than 80% of the side dimension. Example, if the top plate side dimension is 10 inches, then the front dimension cannot be smaller than 8 inches. If you need plates long in the side dimension, see the Big Column stand models. It is possible to order different top and bottom plate sizes. The plate size customization is determined by the largest plate size. Customization price covers both top and bottom plates. For example, if you order a 12 x 12 inch top plate and a 14 x 14 inch bottom plate, the "Up to 14 inches" plate size price will cover both plates. Material thickness varies depending on stand size, ranging from around 1/2 inch to 3/4 inch and more. Generally, the larger the stand the thicker the material used for the plates. 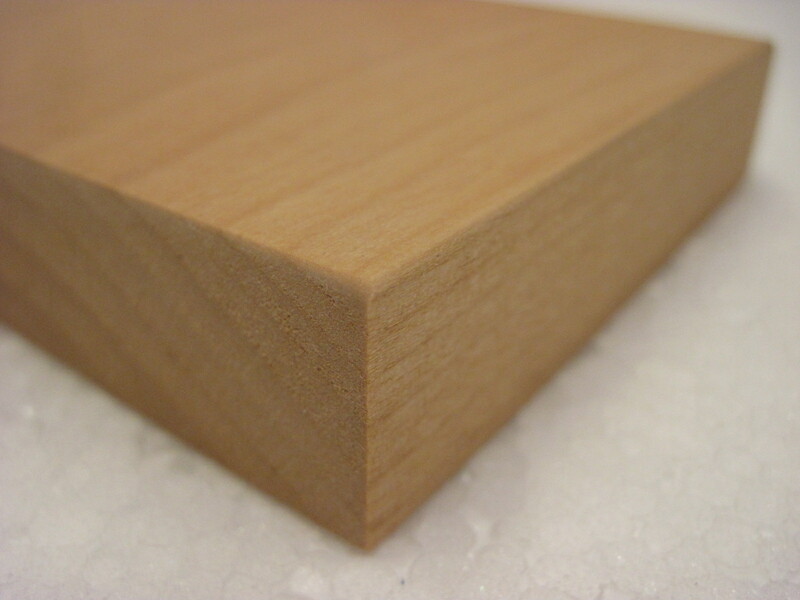 It is possible to special order thicker material for particular needs. Column width and spacing is scaled according to stand size to maintain uniform look. The larger the stand the wider the column width and larger the column spacing. Column width and spacing is dependant on the smallest plate dimensions. When plates are long in the front dimension, such as for a center spekaer, space between the columns will increase substantially. 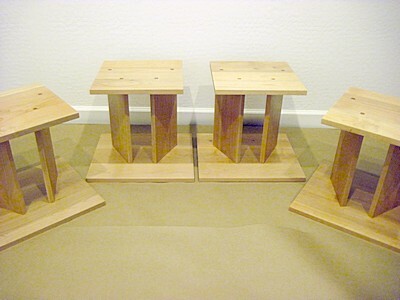 See the Stand Gallery for picture examples of how things will look when plates long in the front dimension are ordered. 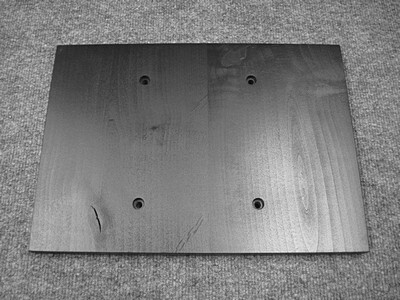 Number of assembly holes varies depending on stand size, ranging from 2 holes for small plates to 4 holes for larger plates. The following plate side sizes can be custom ordered. Pricing is provided for estimating cost. Larger plate side sizes are available by special order. Below are examples of edge treatments. 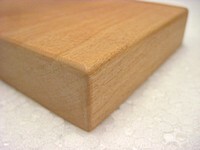 The standard edge treatment lightly rounds edges to remove edge sharpeness and provide a hard edge look. The refined edge treatment substantially rounds edges to provide a more refined look and feel. The amount of roundover for the refined edge treatment varies depending on material thickness for good looks. The poloygon plate shape is limited to simple polygons. More complex shapes may be possible at an additional cost. An auxiliary hole can be custom ordered. Multiple holes are possible. Useful for cable management, mounting speakers, and more. The following hole sizes can be custom ordered. Pricing is provided for estimating cost. Hole position can be specified. Hole position is approximate. Hole diameter can be specified. Smallest hole size is 1/8 inch. Holes larger than 2 inches may be possible at an additional cost. Hole size is approximate. 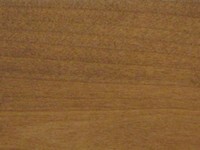 Currently Alder is the only wood choice available. The following sheens can be custom ordered. Pricing is provided for estimating cost. 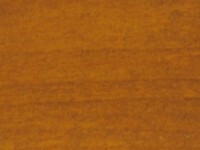 Medium sheen is similar to a satin sheen. Unfinished is bare wood that has been prepared for finishing. 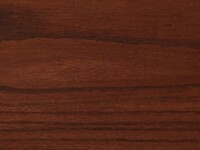 If the unfinished sheen option is selected, Natural Alder will be the only color option available. 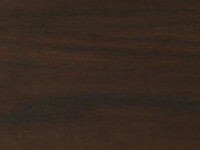 For the finish quality, you will get all the features of the finish quality that are applicable to an unfinished stand. The following colors can be custom ordered. Pricing is provided for estimating cost. 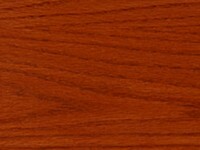 Natural Alder color is the natural color of Alder wood. 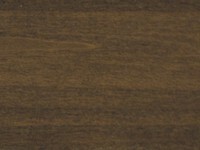 Walnut B color is similar to an Espresso color. Oak A color is similar to a Golden Oak color. 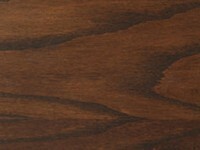 This is a natural wood product. 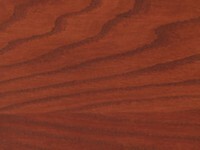 Wood grain and color can vary with each piece of wood. Colors are approximate. Color matching is not available. 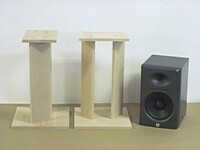 It is possible to order a stand unfinished so one can custom color and finish. For black or white color see the model SS-B Open V Modern listing. It is similar to this model but offers black and white colors. A combination color can be custom ordered. For example, you can make the top and bottom plate color different than the column color. The Combination color price is the total selected colors. Black color is available as a combination color choice. Black color has discounted price of $10. 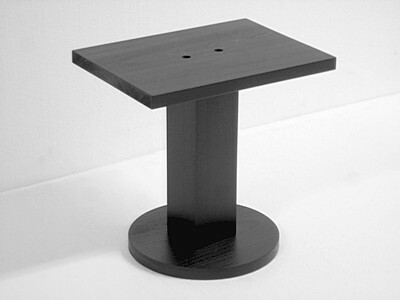 Example pricing, if the stand top and bottom will be Black color, and the column will be Maple A color, the combination color price will be the Black color price plus the Maple A color price. The following finish qualities can be custom ordered. Pricing is provided for estimating cost. 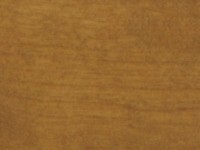 The standard finish provides a rustic look. 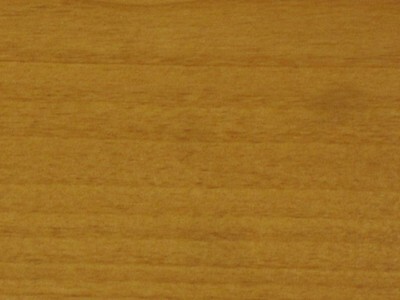 The amount of wood imperfections of the rustic knotty style wood can vary depending on the batch of wood obtained from the distributor, sometimes the wood has few imperfections, sometimes many. 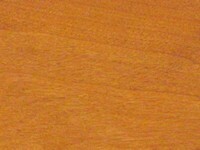 The knots of the rustic style wood are typically split. If you do not want untreated knots and crevices, order the enhanced or better finish quality. If you want a refined look, order the refined finish quality. Example pricing, the refined finish will be $25 plus 20% of the total stand price, including all ordered customizations such as stand height, plate size, column, and other. Shipping price is for within the continental USA. Shipping for each additional stand is discounted 1/3 off the single stand shipping. This is a custom made, made to order item, and created upon demand. There can be up to a 30 day delay before item is shipped. Orders are done in batches, not individually. Current turnaround time is 20-30 days. Shipping price includes transport costs, shipping box, packing materials, packing labor, and drop off with carrier. Because this is a custom made item with many possible configurations, often custom packing has to be done and custom shipping boxes made. This additional service is included in the shipping price. In the listing, some of the item price is included in the shipping price so that prices can be simple and easy to calculate. I do not hide shipping costs in the item price like many sellers do. As an individual doing small volume shipping, transport costs are typically 2-4 times more than what large corporations such as Walmart and Amazon pay. Because this is a custom made item with many possible configurations, to keep things simple, the shipping price is an average flatrate based upon previous shipping costs. When shipping locations are long distance or remote, an additional shipping charge may be added to help cover transport costs. Shipping to Hawaii, Alaska, Puerto Rico, and APOs is available, but size and weight restrictions apply. Please inquire for more information. Shipping to international destinations is not available at this time. International buyers typically have item shipped to an international carrier service operating in the USA, such as an ocean freight service, who transports the item to the international destination. PayPal payment accepted with conditions. Buyer must have item shipped to the address associated with payment. Please make sure address is current when making PayPal payment. Other payment methods accepted include USPS money order, and cashiers check from a bank with a local office in Phoenix, Arizona. For local pickup, Paypal is not available as a payment option. "In short, the Birk�s stands are the most fully-customizable that I�ve ever seen... if you need specialty speaker stands, I recommend Birk�s without hesitation. Their pride of craftsmanship seems unparalleled." "Shipped quickly, very well packaged. " "Thanks, they're great, love em. Will send you a picture when I have them stained"
"Great communication and worked with me on my order." This is a custom made, made to order item, not pre-made or standard size. Listing price is for one basic stand. Orders that go beyond the basic stand limits will be an additional cost. See the Customizing section for more information. Before ordering please read the How To Order, Shipping, and Payment sections.